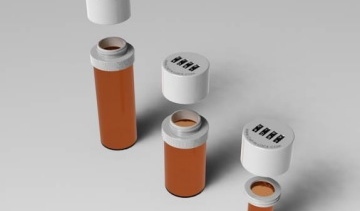 ANAHEIM, CALIF.—Cap-N-Lock LLC has developed a combination-locking cap for prescription medications. The cap was designed to safeguard medication against not only children, but also teenagers, while still being accessible to seniors, according to the company. The cap’s components were molded by Henry Plastics, a Fremont, California company. It consists of eight injection molded parts made of acrylonitrile-butadiene-styrene (ABS) plastic. Cap-N-Lock manufactures the unit. Assembly starts from the bottom up with the locking mechanism —dial numbers included— dropped in first, followed by a tension plate and then the lower twist-on cap. The lower housing ring is then ultrasonically welded to the main housing. The device uses precision ultrasonic welding technology by Dukane Corp., a St. Charles, Ill. welding company. Dukane demonstrated how it welds the cap at the Medical Design & Manufacturing West show in Anaheim.